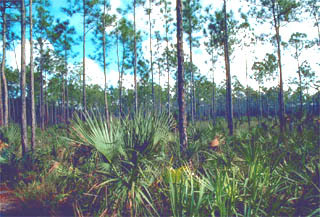 Florida slash pines dominate pinelands throughout eastern sections of the Everglades. 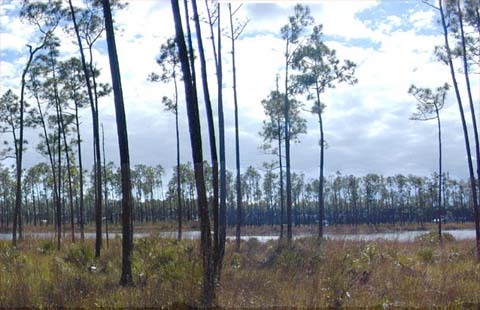 Prior to the 1930s, an extensive forest of Florida slash pines (Pinus elliotii densa) covered much of the eastern Everglades. However, due to the increased demand on these forests for construction materials, most of these pines were harvested. This forest is currently limited to sections of the eastern Everglades National Park with another stand on Long Pine Key. Slash pines also provided a source of sap for the manufacture of turpentine and other products. The sap was collected by cutting a diagonal slash into the trunk of each tree, hence the common name “slash pine”. Today the slash pine is grown throughout the state of Florida for use in paper and pulp industries. With the absence of periodic fires, hardwood tree species residing in hammock habitats would out-compete slash pines, eventually taking over the pinelands. The Florida slash pine is a fire-tolerant species with multi-layered bark, long needles that protect vulnerable buds, and seedlings with thick fire-resistant stems. 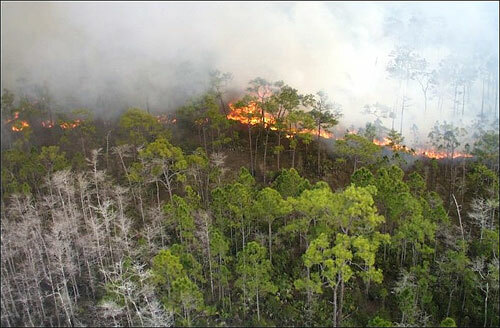 As fires sweep through pineland habitats, only the outer layer of bark is damaged, allowing slash pines to survive while other species are destroyed. 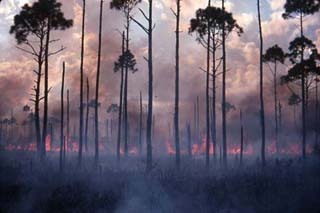 However, if fires are absent for a number of years, hardwoods will invade the pinelands and eventually become dominant.